The new service has a limited roll-out, is free during testing. Hypochondriacs, rejoice! A new, but still very limited Google service rollout will let the sick and infirmed consult with a real, bonafide doctor via video chat, all for the cost of zero dollars (for now). The new service, which was confirmed to be real by the folks over at Engadget, stems from searches dropped into Google Chrome or Google Now. 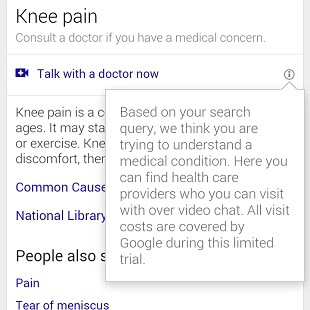 "jasonahoule" on Reddit first posted about the service, which popped up on his phone when doing a search for "knee pain." Once you plug in an ailment, one of the first Google results sent back would be a "talk with a doctor now," feature, which then connects you with said professional. I tried finding the service on my HTC One m8, but where the video chat link would be (based on the image), Google displays a "Consult a doctor if you have a medical concern," message. Bringing the service to Google is certainly new, but the concept of Doctor Quinn, Medicine Skype Enthusiast is not -- walk into any CVS MinuteClinic in the US, and you will see the video conference systems in every examination room. The service, which is only seeing a limited rollout right now, is free during the trial period. We're not sure how the fee structure will work if the service goes wide, but Google Wallet could come into play.